U.S. paleontologists say they’ve discovered a new species of meat-eating dinosaur that lived about 98 million years ago and dominated the early ancestors of fearsome predators such as the Tyrannosaurus Rex. The newly discovered species, named Siats meekerorum after a cannibalistic man-eating monster from Native American tribal legend, is one of the three largest carnivorous dinosaurs ever found in North America. The largest of that group was the T-Rex, which came along about 30 million years after the Siats and weighed more than twice as much. The North Carolina and Illinois researchers behind the discovery say this new species is a member of a group of gigantic meat-eaters called carcharodontosaurs, which include some of the largest predatory dinosaurs ever discovered. Writing in Nature Communications, the researchers say they found the partial skeleton of the new predator in Utah’s Cedar Mountain Formation back in 2008. The remains found by Zanno and research partner Peter Makovicky, from Chicago’s Field Museum of Natural History, were of a youngster that was more than 9 meters long and weighed about 3,630 kg. They theorize that an adult of the species may have been about 12 meters long and weighed about 6,200 kg. The Siats dinosaur lived during the Late Cretaceous period in lush surroundings with large amounts of vegetation and water, which supported a variety of animal life such as plant-eating dinosaurs, turtles, crocodiles, and giant lungfish. Until this discovery, scientists didn’t know what species was the top carnivore in North America at that time. “Carcharodontosaurs reigned for much longer in North America than we expected,” said Zanno. The discovery has filled a 30-million-year gap in the fossil record, when the role of the top predator went from Siats and other carcharodontosaurs in the early Cretaceous period, to species of tyrannosaurs in the late Cretaceous period. That gap in the fossil record had paleontologists unsure of when tyrannosaurs took over the title of top predator and whether it was because they overpowered the carcharodontosaurs or simply took over after the carcharodontosaurs became extinct. The scientists said their research has made it clear that the large size of the Siats meekerorum would have kept the smaller species of tyrannosaurs from besting them. “The huge size difference certainly suggests that tyrannosaurs were held in check by carcharodontosaurs, and only evolved into enormous apex predators after the carcharodontosaurs disappeared,” says Makovicky. “Contemporary tyrannosaurs would have been no more than a nuisance to Siats, like jackals at a lion kill. 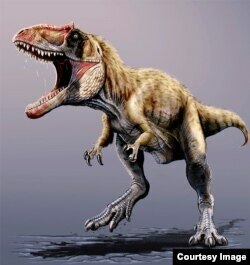 It wasn’t until carcharodontosaurs bowed out that the stage could be set for the evolution of T. rex,” said Zanno.